This is the second image in the series of three from the Flower Soft Wheelbarrow Set, that I've had a chance to work with. I started out by stamping the images in Black Archival on Watercolor paper. (On this sample I actually stamped on the back side of the WC paper, as I wanted a bit of a softer look). 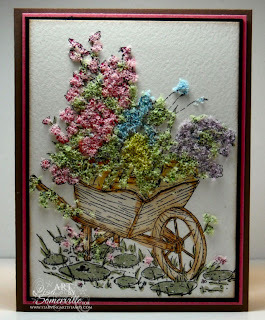 I used my Stamp-a-ma-jig to get proper placement o f the flower images into my wheelbarrow. I just love the SAMJ for things like that and figuring out where's the best place to put a sentiment on my card before I actually stamp it. Do you use a SAMJ when you stamp? There's a method to my madness, when I create. Just in case the Flower Soft didn't adhere in all the places I had wanted it to when I applied the PVA Glue, I did color my images using the Marker Watercoloring Technique, before I added my Flower Soft. When I create my Altered Project in yesterday's post - this was the image I was going to use, but couldn't find a frame to put it in. 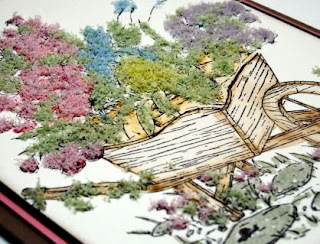 I think it would look pretty in a frame too, putting it under the glass, reminds me of pressed flowers. Outstanding! I can almost smell them. Thanks for the tip about coloring first...method to your madness...HA!....can't wait to get some! I love the look of this card. very pretty. all of your cards are great. you have inspired me to try the flower soft.I've never seen it before.thank you again for sharing. Beautiful card as always Lisa! I think this is the best card I have seen using the flower soft. I think coloring first helps but I also think the use of colors adds a very vibrant touch. Thanks for sharing this and the hint...now maybe I will have to get some. Lisa, This is over the top gorgeous. I went right to their site and ordered the wheelbarrow set and two types of flower soft. This stuff rocks, but it does take a little practice to get the quality that you have achieved - you rock!! I'm going to make one this weekend and I'll post a link for you. Thanks for your tips and for sharing your artistic talent.